After ten days of intensive discussions at the beginning of May followed by three and a half months of joint work, the Better-Late-Than-Never Faction of the International Communist League and the Internationalist Group have decided to join forces and henceforth constitute a single organization, the Internationalist Group, U.S. section of the League for the Fourth International. This fusion not only is an important step forward for the IG, establishing a Los Angeles local, but for the LFI as a whole. Along with the Portland local of the IG we can foresee common work by the West Coast locals, and collaboration with the Grupo Internacionalista/México. Even more importantly, together with the formation of the Nucleo Internazionalista d’Italia by the former leaders of the Italian section of the ICL, the BLTN Faction’s international experience and connections will help lay the basis for the LFI to undertake systematic work in Europe and explore opportunities in Asia. Taken together, these revolutionary regroupments based on the program of authentic Trotskyism mark an important step forward in the process of reforging the Fourth International as the world party of socialist revolution. For the Internationalist Group, the unexpected appearance of the Better-Late-Than-Never Faction is a vindication of the struggle waged over the last two decades to uphold the Bolshevik program of international socialist revolution. Seeing from their own experience how the ICL had turned its back on the revolutionary program on which it had been founded, the BLTN Faction investigated the origins of this political degeneration. They found that the ICL made its first decisive turn away from revolutionary Trotskyism under the pressure of demoralization in the wake of the counterrevolutionary destruction of the Soviet Union and the East European bureaucratically deformed workers states. Despairing of the revolutionary capacity of the working class, the ICL leadership decided to rid itself of the leading comrades who, even in the face of this historic defeat, insisted on continuing revolutionary intervention in the class struggle. This came to a head in the 1995-96 fight in the ICL over Germany, then in Mexico and Brazil and later France, as the ICL wrote defeatist conclusions into its program and sealed this with a series of expulsions and a mountain of lies to justify its retreat from the class struggle (and in Brazil, desertion in the heat of battle). As the ICL revised one key element of its once-revolutionary program after another, repeatedly capitulating to the bourgeoisie leading up to its social-imperialist support for the U.S. invasion of Haiti in 2010, the contradiction between its Marxist pretensions and its actual practice became ever more glaring. From within the ICL, the comrades who formed the Better-Late-Than-Never Faction independently arrived at the same political conclusions as the LFI. They sought to win comrades within the ICL to the realization that if they genuinely wanted to fight for revolution, it would mean, as their document said, to “Regroup with the IG/LFI on the Basis of Their Revolutionary Continuity!” But the ICL leadership immediately moved to prevent such internal discussion by summarily expelling the BLTN Faction the day after they submitted their declaration. This bureaucratic action deprived the Faction of the right to fight for leadership on the basis of their program, and denied the ranks of the ICL the possibility of debating this. But it has not stopped the BLTN comrades from carrying out their program, as we are now doing. Over the last three months there were important developments in the class struggle – including the impeachment drive in Brazil, direct U.S. military ground attack in Syria, the immigration crisis in Europe, and the British vote to leave the European Union (“Brexit”) – in which the League for the Fourth International has demonstrated its programmatic fidelity to our common Bolshevik-Leninist heritage. The ICL, on the other hand, called on Brazilian workers to do nothing in the face of the concerted capitalist assault, and in Europe has sided with the most retrograde anti-immigrant bourgeois reactionaries, positively glorying in Brexit, rather than put forward a program for class struggle to bring down the imperialist EU. During our period of common work, the BLTN and IG/LFI have collaborated closely in seeking to win potential revolutionaries from the ICL milieu to authentic Trotskyism, as outlined in our May 4 Agreement for Common Work. This was highlighted by our joint intervention along with a comrade from Italy in the Lutte Ouvrière Fête in France in mid-May and at the Left Forum in New York a week later. In these reformist and social-democratic/liberal gab fests we had the opportunity to engage in interchanges of a sort with members of the SL/ICL and sold scores of copies of the supplement to The Internationalist titled “Back to Trotskyism,” containing the Italian comrades’ statement of political solidarity with the LFI, the BLTN Faction document and other materials, and a joint BLTN-IG statement (“SL/ICL: Haunted by Revolutionary Trotskyism”). It is telling that more than four months after expelling the BLTN comrades on the basis of their document, the SL has yet to answer their political arguments, instead limiting its responses to trivial snide remarks. A high point of our joint work was participation by the BLTN comrades at the Second National Conference of the Grupo Internacionalista, the Mexican section of the LFI, and seeing first-hand, from Mexico City to Oaxaca, the intensive action of the section in the explosive teachers strike that has convulsed the country for over three months. The GI’s work has been a model of innovative Trotskyist intervention, concretely defending the strike, mobilizing brigades of teachers to carry out our call to extend the strike to key sectors of the proletariat, and fighting against bourgeois populism and popular-frontism, while selling thousands of newspapers and holding weekly study groups and daily film showings and political discussions at the strikers’ plantones (tent cities). The contrast could not be sharper to the ICL, which has not only abstained from the struggle, but actually defends the arm of the capitalist state that is spearheading the attack on the strike – the SNTE corporatist pseudo-union which was created by and remains directly controlled by the government in order to prevent the rise of genuine workers organizations, like the CNTE. A dramatic confirmation of the bankruptcy of the latter-day ICL occurred at a GI forum at the National Autonomous University of Mexico (UNAM) where Oaxaca teachers powerfully spoke (and chanted) against the assertion by the leader of the ICL’s Mexican group that there is no class difference between the striking CNTE and the strike-breaking SNTE, and in support of the intervention against the ICL made by a comrade of the BLTN faction. 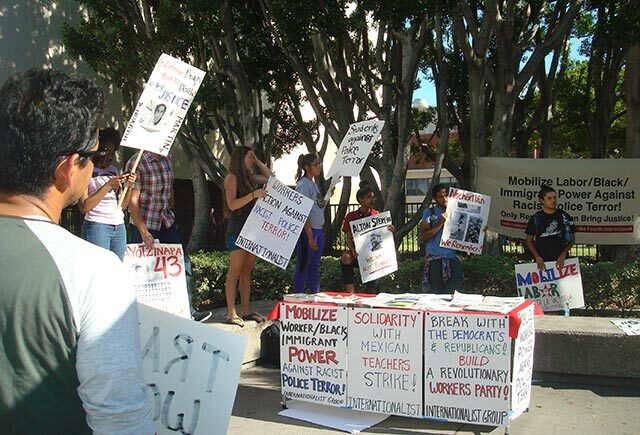 During our period of common work, the BLTN and IG also collaborated in producing propaganda to intervene in protests against the persecution of a Los Angeles-area Black Lives Matter activist, selling The Internationalist and other LFI publications, and launching campus work and industrial sales in the Los Angeles area, as foreseen in our May 4 agreement. While the methods of political work of the IG/LFI and SL/ICL differ substantially – notably assuring, as our Brazilian comrades put it, that our deeds match our words, seeking to carry out where possible what we call for rather than spouting empty rhetoric – we found, from the very first moment after coming into contact, that the comrades of the Better-Late-Than-Never Faction and the Internationalist Group/League for the Fourth International share common values and revolutionary commitment. Having used this period to get to know each other, and since in fact we are already acting as a common organization, we have decided to formalize our Leninist fusion. Forward to the reforging of a genuinely Leninist and Trotskyist Fourth International!